After the long summer break, It’s time for QA talks. This time with our friends from Grid Dynamics Talks we are organizing the event on Thursday, October 18th at 6 pm in StartIT Centar. 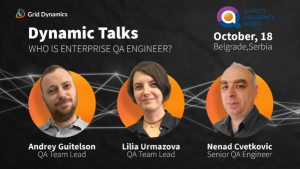 We will try to get into the profile of enterprise QA engineer, an overview of test technologies and career development, then we will try to explain how we handle stubbed users. The best and hottest comes for the end, Artifical Intelligence in Test Automation. – Lilia will describe the particular case when the purpose is to stub users properties responses when we have a lot of services and a lot of properties to be stubbed. -An insight into the field of artificial intelligence based testing tools, and more importantly, it will give a hint on how far we are from the Level 5 – the full automation. 4. Ask what you want? The meetup will be held on the 18th of October starting at 18:00 hours at Startit Center Belgrade (Savska 5). Meetup attendance is free but we require all potential visitors to RSVP at the following page. Be connected, enjoy testing with us!